Earn up to 31,992 reward points. An alto for all seasons. The Master Series 97A Alto saxophone was designed in part to appeal to saxophonists who live in the sometimes thought to be disparate worlds of classical and commercial music. Three years on the drawing board, the Master Series 97A meets and surpasses its intended goal, and establishes itself as perhaps the most innovative P. Mauriat Saxophone yet. 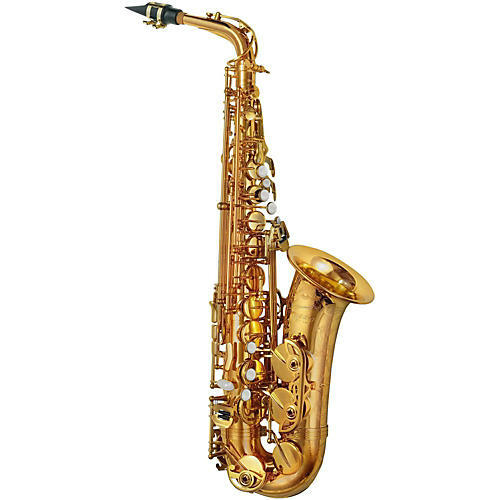 The Master Series 97A Alto Saxophone is a dual-alloy horn with two sterling silver octave pips that add density and warmth, and a yellow brass body, bow, and bell that add a glassy clarity to the top end. It additionally features premium Pisoni pro 105 pads for a tight seal and satisfying tactile experience, along with nylon resonators for improved tone. It is finished in a honey-gold lacquer with mother of pearl key touches, and the bow and bell are hand-engraved with traditional floral patterns. Sound, playability and beauty all reside within this versatile instrument. Order today and get the only alto you'll ever need.